What a rich history Brooks Brothers has obtained. This is one of the countries oldest clothing retailers. Apparel Search solutes Brooks Brothers as one of the nations leading and most classic apparel retailer. Below is a brief history of only some of their many accomplishments. Brooks Brothers is proud to uphold the same traditions and values for nearly two centuries. They believe these are the reasons why their customers consider them to be far more than a store. Brooks Brothers is an American icon. On April 7, 1818, at the age of 45, Henry Sands Brooks opened H. & D.H. Brooks & Co. on the Northeast corner of Catherine and Cherry Streets in New York City. His guiding principle: "To make and deal only in merchandise of the finest quality, to sell it at a fair profit and to deal with people who seek and appreciate such merchandise." 1845 READY-MADE SUITS Brooks Brothers introduced the first ready-to-wear suits in America. Pioneers of the 1849 California Gold Rush, unable to wait on the whims of a tailor, flocked to Brooks Brothers to pick up ready-made clothing. 1850 THE BROOKS BROTHERS Brooks Brothers introduced the first ready-to-wear suits in America. Pioneers of the 1849 California Gold Rush, unable to wait on the whims of a tailor, flocked to Brooks Brothers to pick up ready-made clothing. 1850 THE GOLDEN FLEECE The Golden Fleece symbol was adopted as the company's trademark. 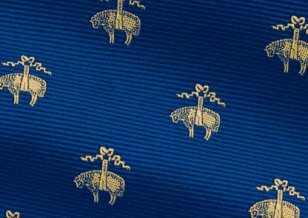 A sheep suspended in a ribbon had long been a symbol of British woolen merchants. Dating from the 15th century, it had been the emblem of the Knights of the Golden Fleece, founded by Philip the Good, Duke of Burgundy. In ancient Greek mythology, a magical flying ram, or Golden Fleece, was sought by Jason and the Argonauts. 1858 BROADWAY & GRAND STREET A second New York City store opened on the corner of Broadway and Grand Street. The store was described as "the most extensive and magnificent clothing house on either continent." This location closed in 1869, and moved temporarily to Union Square, and then to Broadway and Bond Street. 1860 MAKERS & MERCHANTS From the company's founding, Brooks Brothers distinguished itself through the excellent workmanship found in both its custom and ready-made clothing. Being both "Makers and Merchants" gave Brooks Brothers absolute control over its offerings, and ensured its customers of the highest quality apparel. 1865 ABRAHAM LINCOLN'S LEGENDARY COAT At his second inauguration, President Abraham Lincoln wore a magnificent coat (pictured, left) specially crafted for him by Brooks Brothers. Hand stitched into the coat's lining was an intricate design featuring an eagle and the inscription, "One Country, One Destiny." Sadly, it was also this coat Lincoln was wearing when he was assassinated on that fateful evening at Ford's Theater. 1890 THE SILK FOULARD NECKTIE Brooks Senior Partner, Francis G. Lloyd visited England and returned with the silk Foulard necktie, which was quickly adopted into American wardrobes. Many of the tie designs selected during those visits are still used today. 1896 THE ORIGINAL POLO® BUTTON-DOWN SHIRT John Brooks, grandson of the founder, made fashion history by introducing the Original Polo® button-down shirt. His design inspiration came after attending an English polo match where he observed the players' shirts secured with buttons to keep them from flapping in the wind. The shirt became an instant success and soon one of the best-selling Brooks Brothers items. 1904 THE SHETLAND SWEATER The shetland sweater was introduced to the Brooks Brothers collection. Originally hand-made by peasants of the Shetland Islands, the process was refined by Brooks Brothers and was soon to become an American classic. 1910 THE POLO COAT The English polo coat was introduced to the U.S. by Brooks Brothers. Originally white with pearl buttons, it was later offered in grey and the classic camel hair. By the 1930's, more polo coats were being worn by the students at Miss Porter's School for Girls than at any boys' prep school. 1915 346 MADISON AVENUE In the summer of 1915, Brooks Brothers relocated to its present ten-story flagship store at 346 Madison Avenue. This location placed it, not coincidentally, in a neighborhood which had recently become the preferred location for New York's most prominent social organizations, including the Harvard and Yale Clubs and the New York Yacht Club. 1920 THE REPP TIE One of the trends which was established by Brooks Brothers in the twenties was the diagonal repp tie. Fashioned after British regimental or club ties, we Americanized this soon-to-be classic neckwear by reversing the direction of the stripes. By the fifties, the repp tie became synonymous with Brooks Brothers and the "Ivy League Look". 1920 MADRAS During the Twenties, our customers were looking for proper but more comfortable clothing to accompany leisure activity. In another fashion first, Brooks Brothers introduced Indian madras to the United States, with offerings in jackets, trousers, and beachwear for the American buyer. 1930 SEERSUCKER The lightweight summer fabric of puckered cotton, or seersucker, was made available for the first time in America and introduced by Brooks Brothers in frock coats. The most ideal type of warm weather clothing, seersucker was hailed as a great clothing innovation. 1949 THE PINK SHIRT FOR WOMEN In 1949, Brooks Brothers finally devoted a small corner of the store to a women's department. Vogue Magazine featured the pink button-down shirt for women, creating an overnight fashion sensation. 1949 ARGYLE SOCKS Brooks' president John Clark Wood discovered argyle when he noticed a golfer wearing a pair of strikingly patterned, hand-knit socks. Mr. Wood borrowed the pattern to become the first American retailer to manufacture argyle hose. 1965 PEAL & Company Throughout much of the 20th century, Brooks Brothers enjoyed an exclusive licensing agreement with the distinguished London firm of Peal & Company. Peal had built custom-made shoes for Lord Wellington, Winston Churchill, and Fred Astaire. When Peal went out of business in 1965, Brooks purchased the name, as well as Peal's lasts and patterns. 1969 NEW STORE EXPANSION By 1969, there were ten Brooks Brothers stores which were located in New York, Chicago, Boston, San Francisco, Pittsburgh, Los Angeles, Atlanta, and Washington, DC. This was the beginning of Brooks Brothers' store expansion. 1976 BROOKSGATE Brooks Brothers introduced a new department, Brooksgate, featuring tailored clothing designed especially for the young executive. Named to suggest, as one executive noted, "the entrance into the company," it was a hugely successful department. 1979 BROOKS BROTHERS JAPAN Like many things quintessentially American, Brooks Brothers was very well received in Japan. Their flagship store in Aoyama opened in 1979, spreading classic American style across continents. By 1997, sixty-two stores accompanied it. 1980 PREPPY STYLE REVIVAL In the early Eighties, Brooks Brothers enjoyed the revival of the preppy style, selling more shetland sweaters and button-down Polo collar shirts than ever before. 1988 MARKS & SPENCER In April 1988, the venerable British department store chain Marks & Spencer purchased Brooks Brothers. A $7 million restoration took place at the Madison Avenue flagship store. 1991 FACTORY STORES In 1991, Brooks Brothers opened its first in a series of outlet stores in Kittery, Maine. We saw advantage in reaching out to a new audience of customers, and the placement in hugely popular outlet malls gave us a place to send overruns and excess piece goods. The stores were an immediate success and became the fastest growing part of the business. 2001 DIGITAL TAILORING First and exclusively at Brooks Brothers, Digital Tailoring - an innovative body scanning technology that allows the customer to customize men's suits, sport coats, trousers, and dress shirts - was introduced. The result is great fitting custom-made clothing, precisely tailored to fit the body's unique contours and specific proportions. 2001 RETAIL BRAND ALLIANCE Retail Brand Alliance purchased Brooks Brothers from Marks & Spencer. Claudio Del Vecchio is CEO of Brooks Brothers. Mr. Del Vecchio assembled a team which shared his vision of returning quality, value, and heritage to Brooks Brothers clothing. 2003 COUNTRY CLUB COLLECTION The new line of lifestyle clothing, introduced in April of 2003, met standards of quality, comfort and class. Not strictly for golf or tennis, this tightly focused line of clothing is designed for easy movement from the course to the clubhouse and on to the dining room. 2003 185TH ANNIVERSARY In the fall of 2003, Brooks Brothers celebrated 185 years of classic American style. An advertising campaign was launched to celebrate Brooks Brothers' incredible heritage. We are proud to have become an institution that has shaped the American style of dress through fashion innovation, fine quality, personal service, and exceptional value in our products. 2003 INTRODUCTION OF SAXXON WOOL Saxxon, a storied wool with a more than thousand-year-old history, comes from the rarest breed of sheep in the world. In 2003, Brooks Brothers introduced this wool into its knitwear (and later in its suiting). In 2008, Brooks Brothers produced a documentary called Generations of Pride: The Story of Saxxon Wool in partnership with Australian Wool Innovation to tell the story of the remarkable wool and the farmers who preserve the breed. 2003 BEVERLY HILLS FLAGSHIP In 2003, Brooks Brothers opened its 22,000-square-foot West Coast flagship at 468 Rodeo Drive in Beverly Hills. 2005 FIRST STORE IN THE UNITED KINGDOM Brooks Brothers opened its first store in the United Kingdom with a small store in Lion's Plaza in London's Financial District. Less than a year later, an 11,000-square-foot flagship was opened on fashionable Regent Street. 2006 FIRST STORE IN FRANCE Brooks Brothers made its French debut with an 8,000-square-foot, two-level store on Paris' historic Rue St. Honore. 2007 BLACK FLEECE The Black Fleece collection was launched in Fall 2007 in collaboration with CFDA Winner Thom Browne. Black Fleece is a fashion-forward take on Brooks Brothers' classic styling and emphasizes high-quality materials and the strictest attention to detail. 2008 J.J & H.B. 1788 CASHMERE MILLS In 2008, Brooks Brothers bought a partnership stake in a 230 year-old cashmere mill in Innerleithen, Scotland,and today produces all of its cashmere knitwear at the historic mill. 2008 ProSport™ The Brooks Brothers Country Club line is further enhanced in 2008 with the launch of the ProSportTM, a line of high-performance garments featuring innovative fabrics. 2008 BROOKS BROTHERS BY HARTMANN In 2008, Brooks Brothers launches Brooks Brothers by Hartmann, a line of luggage crafted in partnership with another legendary American brand, Hartmann. This luggage, made with the business traveler in mind, was meticulously designed to maximize mobile productivity and capacity. 2008 SOUTHWICK In July 2008, in keeping with its historic claim to being Maker and Merchant in one, Brooks Brothers purchased the 70-year-old clothing manufacturer and in 2009, built a new, state-of-the-art suit factory in Haverhill, Massachusetts, to house the legendary label. 2009 FIRST STORES IN CANADA AND MEXICO In May 2009, Brooks Brothers opened its first store in Canada on Alberni Street in Vancouver, British Columbia. An East Coast Canadian debut was made in September in Royal Bank Plaza in Toronto, Ontario. The first store in Mexico opened a few weeks later in Guadalajara, with a flagship planned to open in Mexico City's Antara Mall later in 2009. 2009 BROOKS BROTHERS TODAY During our remarkable history Brooks Brothers has survived world wars and civil wars, changes in American economics and government, as well as the even more direct threats of constantly evolving fashion trends. Today Brooks Brothers continues to uphold its reputation as an institution based on heritage and value, a commitment to quality, and extraordinary customer relationships. Learn more about Brooks Brothers at the Brooks Brothers website. You may want to learn more about Men's Suits, Men's Dress Shirts, Men's Dress Pants, and Men's Dress Socks.